On April 14th, 2015, an analysis titled "Will the US Apply the breaks to the budget in time?" examined the facts about unemployment statistics, among other considerations. Estimated official unemployment figures that day were 8,528,533, but those actually unemployed numbered 17,036,612. Just a few days ago Patrick Gillespie proclaimed in CNN Money that "Unemployment falls to lowest level in 7 years" underlining that it is the "lowest level since April 2008, according to the latest government data released Thursday". The fact is that as of today, July 15, 2015, the estimated official unemployment figures count a total of 8,272,352 while those actually unemployed number 16,438.193. Let us make clear that the figure of workers actually unemployed (U-6) includes the official figures plus all marginally attached workers, plus total employed part-time for economic reasons, plus those unemployed and actively looking for employment but no longer receiving unemployment benefits. That means that more that 16 million workers are actually unemployed. Of course, this number does not include retired persons, students and others that are not willing or able to work. On the other hand, the "unemployment shadow statistics" (the blue line in the chart above) shows a 23.1% unemployment rate and it is not declining. 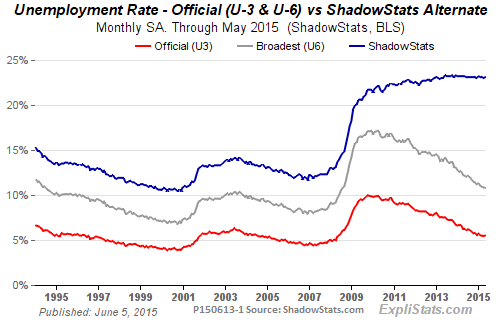 This rate ads to the U-6 parameters those long-term discouraged workers that are no longer looking for employment. Most of them added their numbers to those in welfare. On July 15, 2008, a total of 38,646,345 were counted as living in poverty. As of today, that number rose to 45,285,120. Furthermore, as of this day, exactly seven years ago (2008) the official number of unemployed were 9,514,384 but the number actually unemployed (according to U-6 parameters) was 13,496,385. That means that at that time the US had 3 million workers less than today in a position where they were actually unemployed, including those under circumstances of partial or sporadic work or the ones who are no longer receiving unemployment benefits. As for the discouraged workers in welfare, there are many, many more today than seven years ago. Politicians play with statistics and the allegations of Gillespie in CNN accept this game as a clear case of that practice.